On Thursday December 16, an Israeli court sentenced Ayman Al Ghawi, a 19-year-old Palestinian, to four days under house-arrest following a confrontation with Israeli settlers in the Sheikh Jarrah neighborhood of East Jerusalem the prior day. 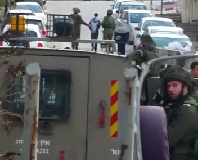 At around 3:30pm, Israeli police arrested a 19-year-old Palestinian man named Imen in Sheikh Jarrah, following a confrontation with settlers. The settlers’ dog, on a 2-meter long chain, attacked Imen as he stood on the street outside of his former home, which the settlers had dispossessed. 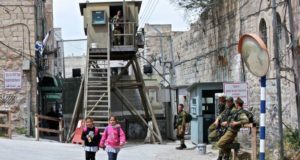 The settlers responded with laughter and walked up to another house, which they are occupying although it had been the home of another Palestinian. As the settlers stood in front of the house, the man who had been attacked swung a pole against the house to make noise to scare the dog away. Then, the settlers began to take pictures with their mobile phones, and called the police. Imen left the area with his mother and his brothers. The police arrived and another settler, who now occupies in Imen’s former home, rushed to the police to point out Imen on the street. The police detained Imen. The police took statements only from the settlers, although international observers and Palestinians also witnessed the events. As this happened, nearly a dozen settlers surrounded and photographed Imen, as he waited in the back of the police car, and his family. Imen’s mother removed her shoe and used it to block the settlers’ cameras to prevent them from taking pictures of her. The police eventually separated the settlers from the Palestinian families. Imen will most likely serve twenty-four hours in jail. Settlers in Sheikh Jarrah often use their dogs to attack and intimidate Palestinians.